By the end of last week, I was thinking we might be taking a break from play dates for a bit. By the beginning of this week, I was sure of it. Somehow, on Sunday, I managed to pull a muscle/ligament on the inside of my left leg that was a mere twinge when it happened, but grew progressively worse as the hours went by. I managed to get out to my OB appointment on Monday morning, though between my leg pain and an inopportunely-timed contraction, I needed the help of two nurses to undress. At that same appointment, I was informed that the new recommendation for the Tdap vaccination is once for each pregnancy, so I allowed myself to be given one, with the warning that my arm would be sore afterwards. I've gotten tetanus shots before, so I thought I was prepared. I was not. I'm not sure if the pregnancy was to blame, but I've never experienced so much pain post-vaccine before. By the end of the day on Monday my entire left side was practically useless due to the agony that any kind of movement caused. By Tuesday, things weren't much better, and the internal exam I had on Monday at my appointment caused both days to be pretty heavy on the contractions, on top of everything else. Wednesday brought with it a relief from a lot of the pain, and more of a semblance of normalcy. I started to consider the play date after all, for Abby's sake. Also, for mine. I didn't want to end up dealing with both a teething baby and a stir-crazy toddler again at any point in the near future (or ever, for that matter). And so, this morning, we got ourselves out of the house. 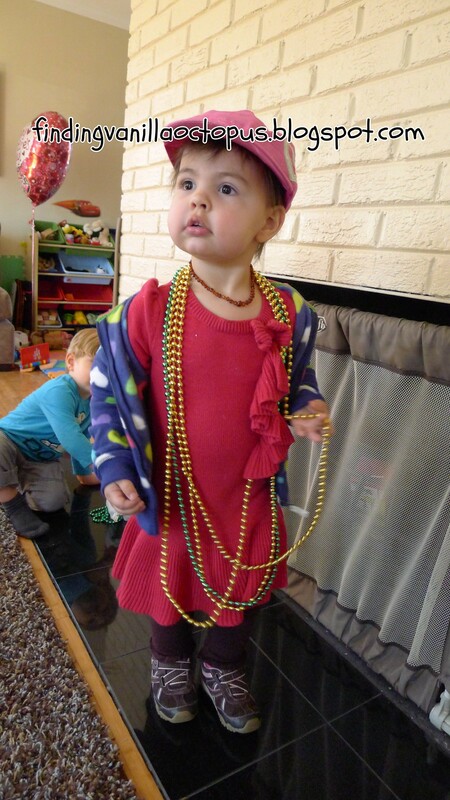 I even scrounged up enough imagination to get Abby dressed "in theme." She sported a pink pair of socks adorned with hearts, a hoodie decorated in colored hearts, and a pink hat with a jeweled heart attached just above the brim. In honor of the holiday, our gracious hostess had prepared a frame-decorating station with wooden frames, crayons, and stickers. 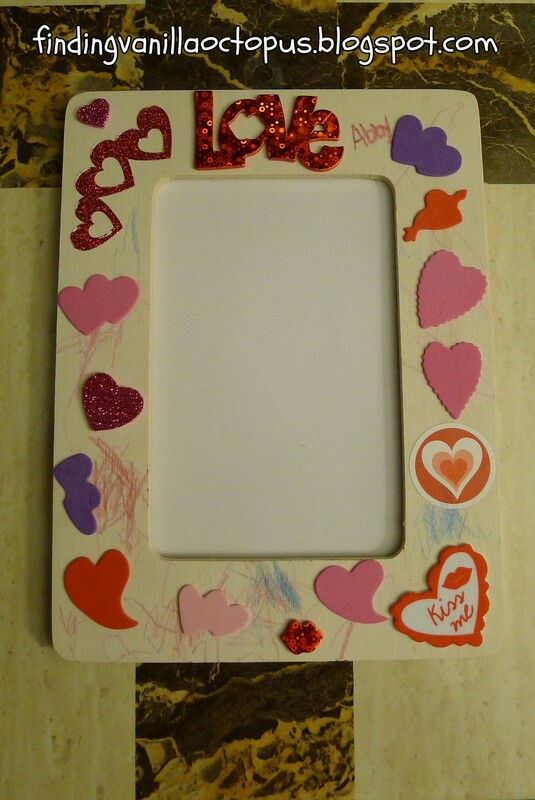 Abby had a blast creating a Valentine-themed craft to go with her Christmas one. And one of the other moms brought lots of Mardi Gras beads to share from her recent trip to New Orleans. Sadly, from this angle, you can't really see the heart on her cap, but she still looks pretty snazzy, no?